Spider Solitaire is one of the most popular card games. It is a fun take on classic solitaire. This patience game gives you the opportunity to play a must have card game! 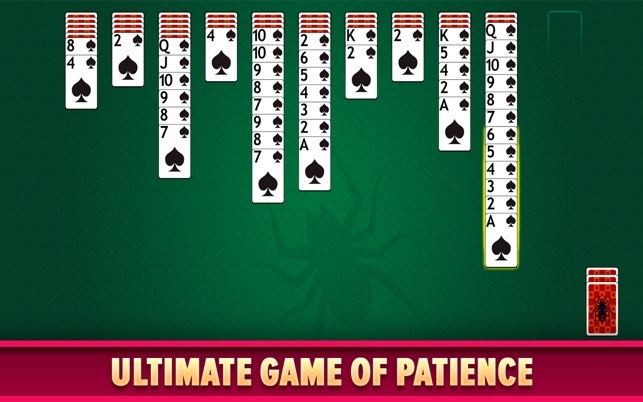 Spider Solitaire is known as the king of all solitaire or patience games. One must be skilled at manipulating the cards they've been dealt with. Overcome challenges and bad cards. Treasure the good cards you have. Use them wisely! Solitaire has been around since the dawn of time, but this version ups the ante by adding sharp, realistic graphics and a superbly designed game board. Download Spider Solitaire today and remember why this challenging card game is considered one of the best in the world. One Suit Spider Solitaire is the best game to begin learning how to play this popular game, as it only has one suit of cards, which makes it the easiest. Played with 2 decks of cards, the goal is to form stacks with all the cards, King down to Ace. 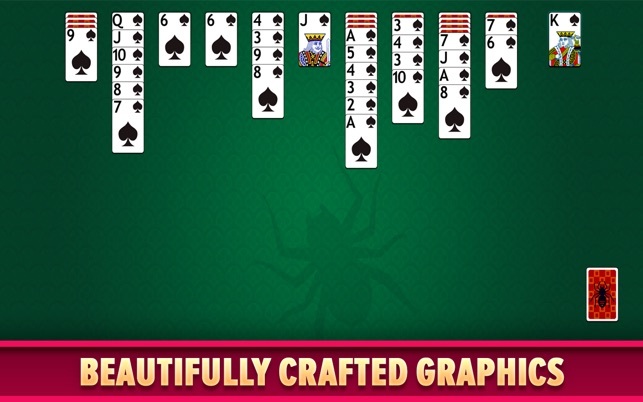 Spider Solitaire comes in a number of different card games. 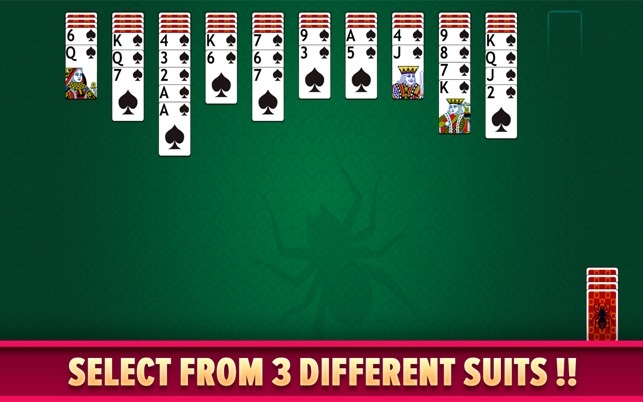 1 Suit Spider Solitaire (as the name implies) is played with only one suit (Spades). Unlike traditional (or Klondike) solitaire, however, you may place any cards of the same suit on top of one another. Just make sure that your cards are in ascending order! Test your skills and luck in this Spider Solitaire game. 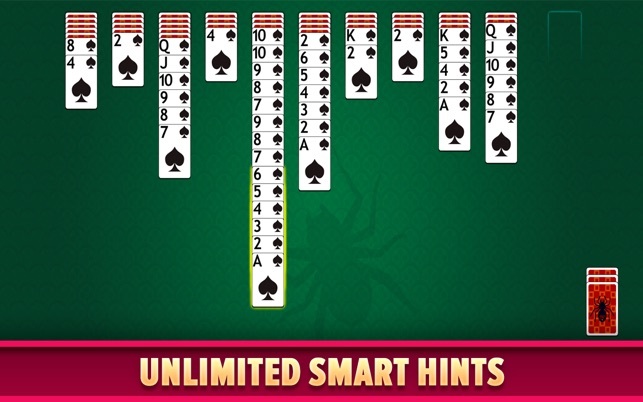 Download and enjoy the popular spider solitaire game and start playing now! 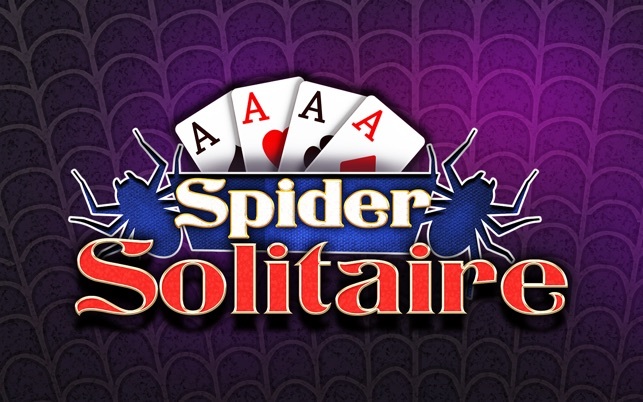 Spider Solitaire is an addictively fun and enticing card game. If you’re enjoying the game Spider Solitaire, please take a few seconds to give us a review! It makes us happy to serve you even better! There is no menu. The menu is there but cannot click on it. I cannot change the default one suite and there is no timer. The hint does not work. Disappointing for a paid app. I hope the update will fix these issues.